Great Barrington — Take a stand for the land, and be a water protector. 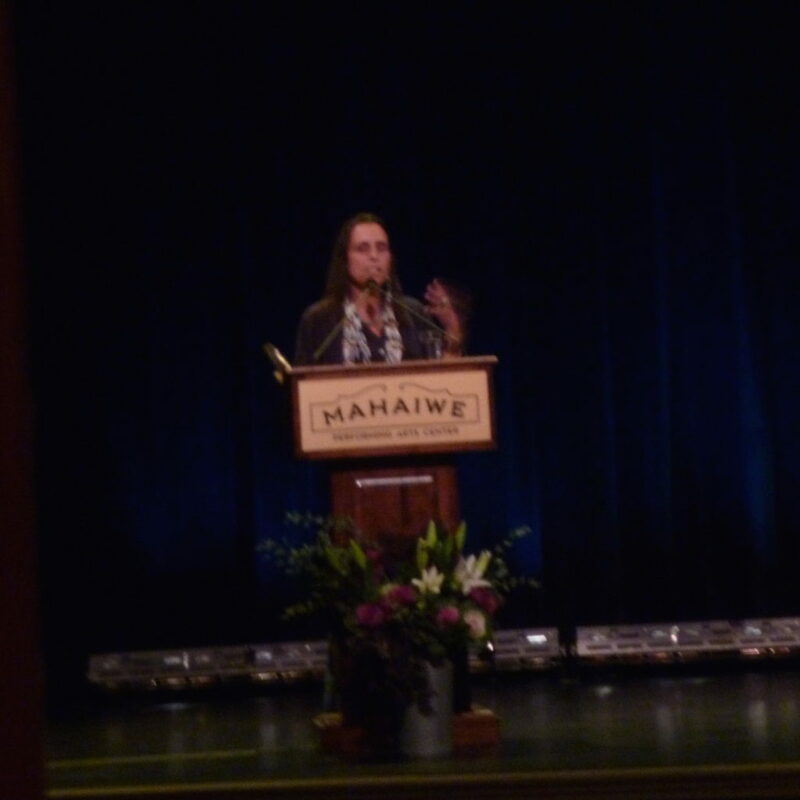 That was the main message that Winona LaDuke and other guest speakers conveyed during the 37th annual E.F. Schumacher Lectures held at the Mahaiwe Performing Arts Center Saturday, November 4. LaDuke, a Native American activist, author and economist, delivered the keynote address titled “Prophecy of the Seventh Fire: Choosing the Path That is Green.” This indigenous prophecy of the Ojibwe Nation holds that a time will come when people must choose between two paths: one that is green and lush, the other well-worn but scorched. According to LaDuke, a member of the Ojibwe Nation of the Anishinaabe peoples, the time to choose is now. The “cannibal economy” LaDuke referred to is the dominant, capitalist economic system that is completely opposite from the indigenous worldview and its principles of sustainability. In a nutshell, these principles as described by LaDuke include an understanding that 1) the creator’s law or law of nature is the highest law of all; 2) the natural world is cyclical and mostly animate; 3) reciprocity and gratitude are essential; and 4) deliberations consider the long-term interest and impact on the seventh generation from now. By contrast, the dominant system makes laws based on who is in power; has a linear orientation; is driven by commodification, extraction and accumulation of wealth; and is geared toward short-term interests and decision-making. “That’s the arrogance of a system that has no check with reality,” said LaDuke. LaDuke cited the example of the rising resistance to fossil fuel infrastructure. She participated in the Dakota Access Pipeline protests at Standing Rock last year, where pipeline opponents invoked the term “water protector” to describe their position. “I’m very honored to be a water protector,” said LaDuke. Currently she is involved in the fight against the Enbridge Line 3 tar sands pipeline in her home state of Minnesota. The resistance is already starting to resemble Standing Rock, and LaDuke said she welcomes folks to come to Minnesota and join the water protectors there. If the state issues a permit for the pipeline this spring, she expects thousands of water protectors will assemble there. A small group of water protectors have come to the Berkshires to support the opposition to the Connecticut Expansion pipeline in Sandisfield. Police-protestor tensions have escalated recently as the pipeline is expected to carry fracked gas starting this month. Activists have fought this project persistently with over 70 arrests occurring since last spring. In response to a question about this local pipeline battle, LaDuke said to keep the pressure on. She pointed out that Kinder Morgan – the company that owns the Connecticut Expansion pipeline – is currently buried in litigation in British Columbia. Following LaDuke’s keynote, a diverse panel of social justice activists discussed topics such as land reform and liberation, indigenous language and decolonization, and doing transformational work in these tumultuous times. “Be a water protector,” LaDuke, who joined the panel at the end, said in closing the event. Water protectors in the audience responded with chants of mni wiconi (water is life) and “we stand!” for the land, the water and each other.